Below is a list of currently available cats at the Brown County Humane Society. Click a cat’s name to read more about them. All pets are spayed or neutered, dewormed and have had at least one set of routine vaccinations (except for rabies). For more information call the shelter at 812-988-7362 or visit us at 128 South State Road 135, Nashville, IN. For cats that say “Petco,” the pet is available at the PetCo store in Bloomington. For cats that say “Foster,” the pet is in a foster home, so please call ahead and we’ll arrange for the pet to come to the shelter to meet you. 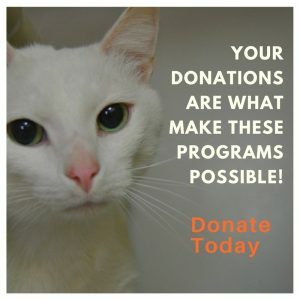 For cats that say “Courtesy”, the pet is not a Brown County Humane Society pet, but belongs to someone in the community that must rehome their pet. Contact the information on the posting to find out more about the pet. Click here to fill out an Adoption Application. If our embedded Available Cat listing does not appear try this link.